A Spark of Deva; Unifying Component to Religions is the Collective System Working Towards Human Cause. True light is when all ideas are captured and then represented in a way that allows all to see by comparison side by side the spectrum and alignments of the web of life. This is a list of core religious studies or the prime studies of religions in the world. This is a list of transitional studies of the world or all the enigmatic studies of religions in the world. 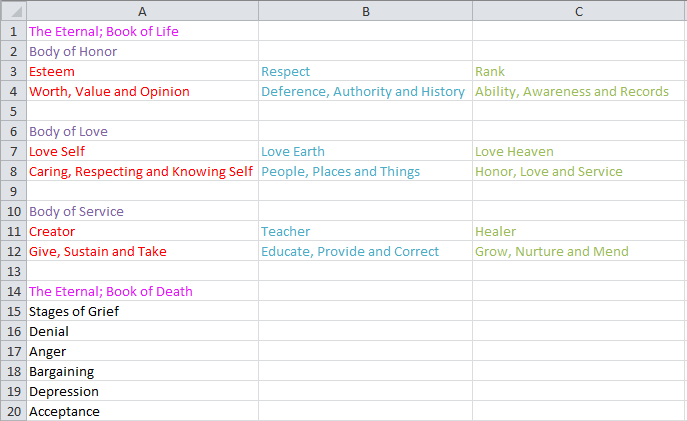 This is a list of realm studies of the world or all the collective systems studies of the religions in the world. These studies give us a wide perspective of the cosmos and the world we live in. I decided to make all of my “Scientific Matrix Poems” in a excel fashion so that people can actually see the alignments better. So let me interpret this chart for everyone. The chart reads that the category of satellite class Moon under representative Muhammad is the religion of Islam and of religious source The Koran. The category of planet class Earth under representative Buddha is the religion of Buddhism and of religious source The Manuscripts of Buddha. The category of star class Sun under representative Christ is the religion of Christianity and of religious source The Holy Bible. This chart is alittle harder to explain only because of the fact that God has a “Casual, Informal and Formal” name. And That Krishna(Love), Shiva(Destruction), Vishnu(Upkeep), Brahma(Creation) are different depths in the process to the identities of the universe’s creation. Category Study of Nothingness is represented by the “Deities of abstract” who’s representatives are Krishna(Love), Shiva(Destruction), Vishnu(Upkeep), Brahma(Creation). The religion is under Hinduism and it’s religious source Bhagavad Gita and Vedas. Category of Origin is represented by the “God Seed of Ideology” It’s representative GOD (EHYEH ASHER EHYEH, ELOHIM, YHWH), Adam(Original Sin) and Moses(10 Commandments). The religion is under Semetism and the religious source is The Torah. This chart i do not know what the holy trinity’s religion is but it was birthed a long side the christian religion but has not been explored to the extent it was suppose to. The Father, Son and Holy Ghost were never a subject explored fully until now. No where in the holy bible is this topic explained in depth, it is just assumed that we did not know or we understood by spirit. The fruit of knowledge was the cause of original sin in this study and it is also the spirit of god in that knowledge that has manifested in man. Consciousness is brought to life through the understanding of the human condition and why we suffer and feel pain. Humanism is the only path to knowing the spirit of God and it is only through the seeing through the vast scope of the abundant information that we can see all this. We define god, God’s composition is us. Category Spirit of totems is represented by Collective animal kingdom under representative The Zodiac. The religion is under the Chinese and the religious source is The 5 elements and 12 Year-Signs. Category Spirit of Humanoids is represented by Collective Heavens under representative of The Gods. The Religion is Norse and it’s religious source are The Legends of Gods. Category Spirit of God is represented by Collective Soul under The Holy Trinity. The religion is Humanism and it’s religious source The Fruit of Knowledge. These are just the parallels I have just made between these transitions, cores and realms (microcosm/macrocosm). The three are as complete of ideas as it is possible maturing and cultivating within the time frame it was given. Neither are more important than the other. All are crucial for a sustainable world. These are the natures, properties and functions of: The Moon, The Earth and The Sun. The Moon (movement, cycles and balances). The Earth (life, activity and love). The Sun (nutures, heals and grows). The Moon is the essence of what is required in a day to rest, dream and recover from the day before. Motion is necessary to begin life and to sustain it. Without the motions of the moon there would be no tidal waves and no movement in the sea therefore life could not start and life would not flourish. Things would not land on the shores and we would not be as we are. Life is a refining of the soul through thorough washing of the shores crashing on the beaches. The Earth is a profound place of life and with life there is activity. Earth is the center of our universe where we gravitate to experience what it is life has to offer and that is individual expressions of experience. Even though the Sun is the Life maker, Earth is the life giver. The Earth’s Love is sustainable, unconditional and conscious it is no ordinary love. It is full of compassion and it’s breathes life into all things. The Sun is the mother of all for the reason it is nature in it’s purest essence. It nurtures us and gives us healing properties. The reason why our Solar System is called Sol is for the loving nature of our Sun. Sol means Sun in Spanish. It allows a habitable range in space for our Earth to grow without being scorched by the Sun. It gives us the power to grow, become ripe and spread joy to the world. The world is a speck in the universe, it is a tiny thing and the probability for life as low as it is cannot replicate as well as it has on Earth today. Live, Breath and Spread Joy. Reduce the suffering of others and don’t forget those who have contributed to the effort that is mankind. I have another understanding when you say ‘collective system’ and it comes from the Theory and Practice of Systemic constellations (or Family constellations work originated Bert Hellinger). It is a school of thought that works from the premise that consciousness at a societal level has 3 levels – individual consciousness, group or collective consciousness, and spiritual consciousness – and there are dynamics within and between these levels by individuals who are members of group(s) who are again part of a whole as a gestalt. If we transpose the thought commonality between religions across the globe on the realm of group/collective consciousness, we would have the range of values that permeate, even govern, the thought dynamics of people in groups, which in turn affect individual thinking and conduct. Beautiful work – documenting these thoughts on excel. Iv been struggling a bit with capturing ideas on paper in a way that makes sense. Been trying mind-mapping and that has its benefits too. n-D manipulation of ideas in the head has been mostly what I been doing but palpability and scalability therefrom becomes slow. Any ideas on how to simulate multidimensional thought on paper or media? Beautiful work you do. Thanx for sharing. Hurrah for you; Someone who speaks my language, lol. I am excited. Yes collective thought or spiritual consciousness in a gestalt causes a massive change in individuals. This idea of mapping out religion putting it on a platform where we can see all it’s relationships is indeed a means to refining this gestalt of consciousness. I have been tinkering with multidimensional platforms.. it’s just explaining it is rough. It’s like what i have done here.. except simulating multidimensional thought through paper and media requires me to do 3d modeling. I don’t mind it- and it’s probably not that hard to generate a 3 dimensional diagram to represent multi-dimensions. I would represent multi-dimension in a dandelion fashion. Each one of those seeds represents a dimension.. depending on how many dimensions you want you make a shape of course. From 3 minimum dimensions to infinity – 3 triangle, 4 square, 5 pentagon – etc. Thank you for your lovely well thought out response. Must admit it is a relief to find somebody, anybody who talks alienese (my label for multidimensional logic of thinking). It is rare and hence ‘alien’ in various degrees of familiarity. Relief to be able to discuss topic that has largely been monotonous (read, in my head). Thank you so much for the flowerette idea (that is the image that comes to mind with your suggestion). Think about it, I have been working with concentric circles of late (I didnt even realize I was making progress thusly). Excited! Happy day ahead! https://modernphilosophystandards.files.wordpress.com/2015/06/eternity3dfinal.gif This is as multidimensional as i’ve gotten infusing my “book of life” paradigm with “book of death” paradigm. It was just an experiment i did a while back. But if i could get every one of these dimensions to become a 3 part system.. all physical, mental and spiritual aspects. In this manner we could have a multidimensional worlds on paper. By the way the way you would portray multiple universes is by starting with stems of the seed first in the dandelion.. you would call it a star first steming x, y, z in all direction i would say you need 27 ideas to make a make a stable balanced diagram. once you have 27 ideas to represent dimensions i would expand them into universes which would bring you to the dandelion idea and it would sprout in whatever which way.